Pioneer Woman Museum was dedicated September 15, 1958, just east of the statue. The museum preserves the legacy of women from all races, creeds, and nationalities who have contributed to the development of Oklahoma. The museum’s education center features craft demonstrations, special exhibits, an interactive timeline, and the Pioneer Woman Walk of Fame. The museum is dedicated to the enduring spirit of women—past, present, and future—who see no boundaries. The Pioneer Woman is a heroic bronze statue of a young, sun-bonneted pioneer mother, protectively leading her son by the hand, striding confidently, head held high—a young woman of sturdy beauty and dignity whose eyes are fixed on the far southwestern horizon. Courage, determination, and humility are in her face. A bible is in her hand. The bronze cast is seventeen feet high and weighs 12,000 pounds. The monument is thirty feel total in height. It was erected in 1930 at a cost of $300,000. The monument was conceived, directed, and financed by Ernest Whitworth Marland, an oil man, philanthropist, US Congressman, and tenth governor of Oklahoma. In October 1926, Marland invited sculptors to submit competitive designs in the form of small models. Four months later the models were exhibited across the nation and 750,000 people cast their vote. Bryant Baker’s model was the most popular by a large margin. Baker was born in London in 1881 and graduated from the Royal Academy of Arts in London. He came to the United States in 1916 and was a sergeant in the US Army in 1918–19. 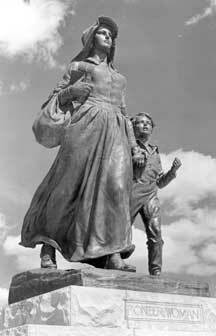 Unveiling ceremonies were held April 22, 1930, the anniversary of the first land run in Oklahoma. The ceremony was attended by 40,000 people. President Herbert Hoover gave a brief radio address from Washington, DC, as did Colonel Patrick J. Hurley, a native Oklahoman and then Secretary of War. Oklahoma’s favorite son, Will Rogers, also spoke briefly.